Ben Ainslie and Jimmy Spithill enjoyed big recoveries on Saturday to vault to the top of the leaderboard at the Louis Vuitton America’s Cup World Series in Muscat, Oman. Ainslie and his team were the class act. After incurring a penalty for starting prematurely in the first race, Land Rover BAR sailed back up the fleet to salvage a third place finish. They followed this with two victories, to finish the day four points clear at the top of the leaderboard. With breeze holding between six and eight knots boat handling was about flying hulls rather than foiling the AC45’s and staying out of trouble. This there was no shortage of action despite the light wind conditions with multiple passes, penalties and lead changes. Land Rover BAR were pushed over the line by Groupama Team France in the first race, and had to take a penalty, but with fast boat speed and good tactical decisions they recovered to place third. The second race saw a flawless start give the team a big lead at the first mark, that they then built on to win comfortably. 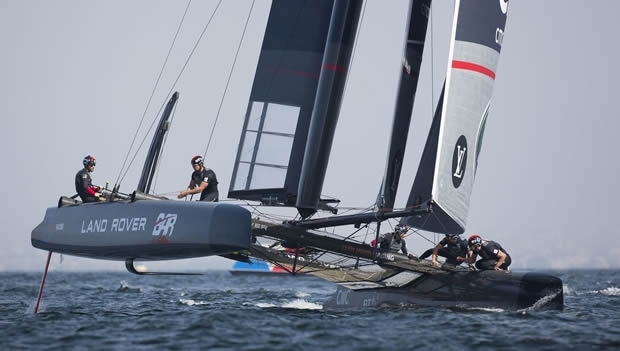 But they saved the best for last, lying fourth at the first mark, they passed Emirates Team New Zealand, Softbank Team Japan and finally the holder of the America's Cup, Oracle Team USA, to score their second bullet of the day. But Ainslie said it was anything but easy in the light winds: “These conditions make it very challenging for everyone on board. You need a decent start and to go the right way, so it’s tough on the tacticians. And then the big Code Zero headsails make for hard work for everyone else. It’s a big day for the team. "A really big day for the Tacticians. Giles Scott did an awesome job for us, getting us going in the right direction and making the right choices on the modes that we sailed the boat, and the sails that we used." "The team work was the key to the day in these conditions, you need good starts, and you need to go the right way, but the crew work has to be perfect. If you miss a manoeuvre it costs you hundreds of metres; they [the crew] did a really good job today." Giles Scott, Land Rover BAR Tactician added: "We're really pleased with that [second] race, it was a case of keeping it simple. The manoeuvres are so costly, so you have to get a good start, we did that then it was a question of getting to the bottom gate and staying clean from there. "We had a little chat about the start [of the second race], and we thought the line was reasonably even with a slight preference to the leeward end. Normally it's really congested down there, but Ben did a great job of owning that end, it was a really good start and we came good from there." Paul 'CJ' Campbell James: "Day one of Oman was as expected with light winds, we have done a lot of training in these conditions back home and it really paid off today. We are moving forward through the fleet which always feels good. And especially in the last race we seemed to have good speed, good boat handling and good tactics, and that won us the race so everyone is really happy with race day one in Muscat." Oracle Team USA appeared to be in jeopardy at several points during the afternoon, but when the points overall at the end of racing Jimmy Spithill and the US team were lying in second overall. Emirates Team New Zealand sped away to a ‘horizon job’ victory in the first race, but fell back into the fleet later in the afternoon. For skipper Glenn Ashby it simply felt good to be out competing again: “Great racing out there today. It’s been so long since we all battled it out. It felt good. We had a great first race, but unfortunately we got bounced around a bit in the last one.